It has taken considerable time for me to accept the view that my hard-won training in child psychotherapy from the late 1970’s and early 1980’s, centered in psychoanalytic concepts, such as psychic trauma and the “search for meaning,” no longer offered me a tenable theoretical framework for my professional practice. Profound changes, summarized as the paradigm change in psychotherapy (Schore, 2012), have overtaken the traditional psychoanalytic treatment of psychic trauma. The neuroscience of trauma informed care, backed by research, now poses a major challenge for all on-going trauma-informed psychotherapists (Halasz, 2017a, b). For reasons that should be obvious to anyone whose parents survived the Holocaust (both psychoanalysts and others), just as other Holocaust survivors (including my mother and late father) brought their particular survival instincts and attitudes – survival systems known as the bottom-line-defense of dissociation – to bear upon their own trauma, so would have those survivor psychoanalysts who treated analysts. Howell and Itzkowitz (2016) offer a full account of the complex relationship between trauma and dissociation found within psychoanalysis. The idea that psychoanalysis itself is “a survivor of the Holocaust” is further supported by Peggy Reubens’ (2007) moving reflections of a roundtable discussion, in effect testimonies given by four renowned psychoanalysts, Drs Clemens Lew, Eva Metzger Brown, Sophia Richman, and Dori Laub, who, in turn, recount their own experiences of being psychoanalyzed. They provided unique insights as witnesses to a time passed, nachträglichkeit, when it was still not possible for their own analysts to analyze their real childhood traumas endured during the Holocaust (Video – “Last Witnesses: Child Survivors of the Holocaust”, 2007). This being the case, the responsibility for the delay in sorting out the definitions and mechanisms of Holocaust trauma transmission rests within the profession, with us as psychoanalysts and psychotherapists. I attempted to address this problem (Halasz 2017a) as another dimension in the context of the book, Wounds of History (Salberg and Grand 2017). Just as therapists are taking on board the principles to practice a neuroscience-driven paradigm to provide our patients, and importantly ourselves, with “trauma informed care,” so also I have had to change my own approach to Holocaust related trauma, both professionally and personally. This change has been taking place both in my clinical practice as well as in my family and social relationships. In contrast to my younger years, today I consider the centrality of safety and self-care, basic principles of the new paradigm, as the emerging organizing principle to regulate relational trauma both my personal and professional relationships. In the following article, I describe how my awareness and the centrality of self-care and safety have directly impacted on both my mother and I, as we prepared for an exceptional outing, for a day at the movies. Last year, a patient in his early twenties, asked during a therapy session if I had seen the recently released film, “Inside/Out” (2015). I replied, “no,” but added that his description sounded most interesting and relevant to our therapy. I thought to myself that, if for no other reason than for the sake of the therapy, I should go to see the film. I was amply rewarded by the unexpected benefits of being inspired by the clear images on the screen which dispelled many vague ideas I held on how I should inform my patient why his long-standing relational trauma found expression in his paralyzing panic attacks. While viewing the creative film was fun, this amazing animation also fired my imagination, to provide a visual language and a clearer picture (no pun intended) as to how I needed to approach my explanation and try to make sense of the mystery of complex emotions that daily arise from our inner life, especially where trauma disrupts our innermost sense of safety and well-being. The film highlighted extraordinary visual insights into the lead character’s emotional upheavals as the outcome of relatively simple processes, such as clarifying how her brain managed and orchestrated her emotional relationships. Especially telling was the emphasis on the well-understood self-regulating processes that seemed to let her down when she was overwhelmed, on the verge of panic and chaos. These poignant moments were ever so disruptive to her sense of safety and well-being. Her 11-year-old inner world, depicted as colorful animated mental structures, included her conscious and unconscious self; her value systems graphically represented as separate islands; bridged by rows of bowling-balls standing for her short and long-term memories. Her levels of consciousness were equally ingeniously managed, or not, by her central control systems consisting of her emotional drives: Joy, Sadness, Fear, Disgust and Anger, often in scenes of passionate dispute at the control console. All of these insights made for riveting viewing. I was most impressed how accurately the film managed to capture our current ideas of the neuroscience of emotional regulation. The clear visual narrative translated complex ideas into readily accessible images, even as I would have liked to see shame, moments of dissociation and reparative moments included – but that was just my sense of greed getting the better of me. In fact the following year I had my chance to build on this creative cinematic experience, to exercise my capacity to visualize my own experiences of relational trauma and self-regulation in relation to my mother. I had a chance to interlace and update my earlier visual representation of how my mother and I share some of the deepest registry of trauma experiences during our altered conscious states, like fugues, attuned to each others’ traumatic dissociations (Hopenwasser 2008, 2016) and, later on, many, many reparative moments. These flashes of visualized mechanisms I shared with my mother in our many discussions and reviews, and so we continued with the preparation to see Son of Saul (2015). There, we immersed ourselves in a profound shared cinematic exercise, to transform moments that re-traumatized to moments that de-traumatized. Such is the anatomy of a ‘reparative moment’ to which I now turn. In rapid moment-to-moment flashes, we glimpsed scenes of massive trauma, dissociation, and reparative moments both on the screen and within ourselves. My mother and I witnessed brutal scenes unfold on a screen, scenes that in real-time she directly witnessed as a seventeen-year old. That was the last time she saw her mother, Esther, and little sister, Zsuzsi, alive. The challenging question we confronted was whether such a cinematic re-exposure to my mother’s previous life-changing Holocaust trauma risked impairing, or perhaps improving, our current well-being and the shared safety enjoyed in our current relationship? Why did my mother, Alice, invite me, George, to view the Oscar-winning film Son of Saul? After all Alice, a survivor of Auschwitz, had already paid homage to the memory of her younger sister, Zsuzsi, whose last breath as a child was in a gas chamber. Why would my mother choose to revisit that moment, knowing the film’s theme? She knew that László Nemes, the director, had reconstructed a story centered on a fictitious main character Saul Ausländer, a member of the Sonderkommando, (mostly) Jewish prisoners, whose special task was to participate in every phase of the extermination process, including the gas chambers, where her mother and sister were murdered. So why would my mother make a conscious decision to put herself through the anguish to witness, yet again, such a traumatizing event? Even more disturbing, Géza Röhrig as Saul, portrayed his ordeal with such intensity that his searing portrait forced me to focus less on the spoken words – in German, Yiddish, Hungarian and other languages – or the subtitles, but rather to be mesmerized by his sub-verbal communications conveying raw visceral emotions. So, I wondered what had motivated my mother to invite me to view with her a film that surely must confront her with flashbacks to her teenage years? Why would she expose herself to images and scenes that must surely evoke the very last moments that she saw her little sister, Zsuzsi, and her mother, Esther. Why? ‘I want to go back there and, this time, come out breathing the air with a living relative’ was her simple, devastating reply. Now a decade later, I guessed that she was prepared and ready to yet again confront another layer of her innermost, intimate trauma. Like a decade before, she wished to share that moment with me, once again. As part of my preparation to join her to see the film, I decided to do as much background reading and research as possible. But reading was not enough. I decided I needed additional preparation. For the sake of my emotional safety and our safety, I should see the film first alone. Armed with my notebook, I went to confront the film. Of course, my own stress reactions intensified in the days leading up to seeing the film. My planning resembled a military reconnaissance – my act was to reconnoiter – to gain as much information about my reactions to the film as I could. Like a military operation, I went to observe, survey and to become familiar with the enemy stronghold, likely sources of stresses, threats and vulnerability, any psychological triggers that we may be exposed to during the planned viewing-witnessing. In fact, I found that on this, my first viewing, I was much more preoccupied with tracking how I imagined that my mother might react to certain confronting scenes, like the events inside the gas chamber, much more than tracking my own reactions. Later, I realized that this was me automatically (or by second nature, so to say “naturally”) switching into my parentified child role – the child who instinctively puts their parent’s emotional needs before his own. My intention in that first viewing was to assess, as clearly as I was able to, the likely psychological threats that may impact us when we came to view the film – which I now thought of as a threat or enemy. The film, so I thought, would pose a real threat to our sense of safety. In my familiar, familial roles – son, parentified child, doctor – I was familiar enough how to switch between my roles, how to behave in often repeated, long-standing roles. The parentified child role is familiar to many second generation children of survivor parents who, often without any conscious awareness, have taken on the burden as care-takers, especially so when their parents show signs, even fleeting, subtle emotional signals of stress. Based on my earlier reading of the many film reviews, I clearly expected that the film would continue to be a major source of on-going stress to us, even after we had finished viewing the film. The after-images would sear into our brains for weeks. As such, I calculated that this outing to the movies could potentially pose a serious threat, to have the power to disrupt my mother’s, and my own, sense of safety for weeks or months to come. my focus needed to concentrate on how I might better regulate my psychological survival instincts. To achieve this aim, I had a whole suite of objectives. I knew from many previous shared Holocaust-related experiences with my mother – such as participating in facilitated inter-generational group sessions (2000-2005), and our previously mentioned pilgrimage on the Adult March of the Living (2005) – that we would, while viewing the film, confront many moments of extreme stress. I needed to thoroughly prepare myself if we were going to emerge from the film safe-enough. How we would manage the film experience would partly depend on my capacity to track my own minute-by-minute distress, and to regulate it. Further, during such times, I wanted to be able to retain my capacity to remain a reliable witness. I determined that this capacity, in turn, would largely be the outcome of my ability to deeply engage with my emerging stresses, to try to nip them in the bud, so to speak. To mentally prepare myself for such moments I returned to a trusted technique that I had learnt at the very beginning of my training days in psychotherapy. I still have my notes from 1979 on Dr Tom Main’s paper “The Ailment”’ (Main 1989). While Main labeled this gamut of feelings as the ailment in a hospital setting, Dr. Vicki Gordon and I (Halasz & Gordon, 2015) have found it of great use during our experiences on the AMotL (2005 – 2015), where we applied the ailment to inform our need to self-care during our encounters on the AMoL. In that context we thought of the ailment in the original psychoanalytic terms. In contrast, today I use the ailment as a portal to explain the mechanism of trauma based in dissociative attunement (Hopenwasser 2008, 2017); – a painful state, and vicarious trauma or relational trauma (Schore, 2012); – another painful state, which I am prone to enact in my clinical encounters. “The patients suffer severely and have special needs which worry all around them. They tend to exact strained, insincere goodness from the doctors and nurses, which leads to further difficulties, to insatiability, to a repetitive pattern of eventually not being wanted, and to the trauma of betrayal; it also leads to splits in the social environment that are disastrous for the patient and the continuance of treatment.” (p. 34). Returning to my preparation for the film, my point was to sustain my focus with a heightened level of awareness on my emerging moments of the gamut of feelings – my aliment – even as my tendency would be to enter such states of dissociation – fugues. Such moments would be signaled by my drifting off. My challenge would be to catch these critical moments, even as my mind tended to wander off during stressful scenes. I wanted to see if I could prevent these moments of dissociation taking hold for any length of time, while knowing full well that they would recur. I wanted to train myself to extend my level of sustained self-awareness. Or, if I found myself already rousing after a period of absence, to be able to remind myself, as soon as possible, to focus on regaining my sense of awareness. How would I achieve this goal? I had lots of practice derived from my psychotherapy experiences, through my attention to self-regulation by breathing. This tried and tested method, successfully deployed for the last decade in my clinical work, allowed me to re-engage with my moments of detached, fugue states. Over many years, I had learnt that I could gradually work my way up (not so much working through) from such dissociated states by an act of will. In other words, I had learnt to force my attention onto my pattern of breathing to provide the essential perceptual moments to subtly rebalance my awareness. Through such self-monitoring exercises I was gradually able to return to my focused awareness, breath by breath – inhale (sympathetic trigger), pause, slowly exhale (parasympathetic trigger) – to find my way back to my fully conscious self. verge of dissociation. I used as an additional aid my journal, reminding myself to take notes during certain critical scenes. Taking photographs also helped to fill in my dissociative gaps, my self-repaired nachträglichkeit moments, afterwards. (see photo below). Thus, with my dissociative visceral cascades somewhat regulated and restored to balance, more or less, I was later even able to visually represent my imagined fMRI-scan, as spatially and temporally focused on my amygdala/limbic networks. So Son of Saul should provide many such dissociative gaps. But as well, the film should also invite many entry points into uncharted territory where, some might say, angels fear to tread. (Above, I take notes before, during and after the film. Weeks later I paint a ‘self-portrait’, a series of four fMRI-scans representing my reparative ‘micro-moments’, micro-nachträglichkeit, as a visual representation of my journey from ‘trauma-to-safety’). I repeatedly focused on making restorative links between my various levels of dissociations as part of a series of self-administered ‘reparative’ exercises. From such exercises, I was able to more deeply interrogate my set of senses (visual, auditory, tactile, taste and olfactory, as well as my visceral gut-feelings) as they would have fired off rapid salvos during the film, within myself and between my mother and I. Here, in this cinematic context, both my mother and I were experiencing, yet again, a new inter-generational relational context. With each rapid cycle of stress depicted on the screen, the task was to retain a semblance of balance – like a tightrope walker – between re-and de-traumatizing micro-moments. Looking back, on balance, each cycle contributed to increase our reserve of reparative moments. To make sense of these micro-moments I had be willing to let go of my earlier training in psychotherapy and to rely on the new paradigm, the new trauma informed framework if I was to continue my interrogation of the nature of trauma transfer. This new framework no longer fitted an individual frame of interrogation – what did you think, feel, sense. Rather it demanded an inter-subjective frame of interrogation – what did I and my mother, together, come to think, feel and sense as we were being experienced by each other, inter-subjectively, in two directions, her state influencing mine and vice-versa. This was my ‘aha moment’! I came upon the idea of a micro-nachträglichkeit moments. But that is a story for the next chapter in our shared voyage of discovery. I have chosen the Son of Saul as an applied example, a case study, in the neuroscience-driven paradigm of trauma informed care to highlight the advantages of the new paradigm applied as a mother-son trauma therapy intervention for two reasons. 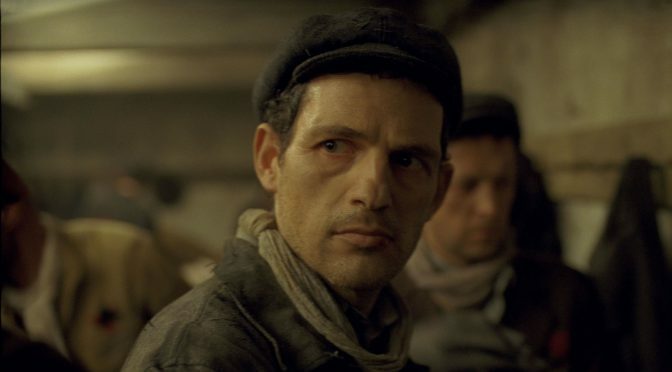 First, viewing Son of Saul provided my mother and I with a unique, personalized confrontation with intimate moment-to-moment exposure to traumatic scenes on the screen, allowing us to witness the actors’ facial expressions, prosody and body gestures. Second, the experiences outlined above underlined how my mother and I have learnt to slowly tolerate, as incremental steps over the last few decades, and to respect the overwhelming power inherent in witnessing Holocaust trauma. But from those experiences arose many lessons. One of the main lessons we have learnt has been to take great care for our safety as we approach experiences of known trauma, such as Son of Saul, carrying an inherent risk to re-traumatize, for different reasons, both my mother and I. We have learnt that, with careful attention to detail that focuses on safety and self-care, on this occasion, we transformed such moments of potential trauma to become moments that were, in the end, de-traumatizing and reparative. Over the last decades, my mother and I are slowly learning the lessons of how witnessing Holocaust trauma retains its power, the power to transform us individually, at the level of our core identities, to transform and break our habitual patterns of relating – enactments – to transform the very foundations of how we regulate our sense of safety and trust. As we review our new-found emerging patterns of relating, we come to realize that we are less and less relating from our past automatic enactments, but rather we relate more and more from a new found sense of sincerity and capacity to love being in each others’ company. I would like to thank Dr Vicki Gordon who has shared the decades long-journey on the Adult March of the Living (AMotL) from 2005 onwards and the many insights we share as we have collaborated to deepen our understanding of the power of witnessing – how the transfer of trauma takes place between the generations. Vicki and I also belong to a study group, who I also thank, fondly called ’Denise’s Breakfast Group’ – after more than 20 years we are still in search of an official name – for our ongoing inspiration. I also thank the members of our ‘Writer’s Group’, Caryn Granek, Marcia Jacobs and Ruth Wein for the special support and insights. My special appreciation to my uncle and aunt, Peter Handelsmann and Anne (Anci) Handelsmann-Braun, for the many nourishing hours of stimulating conversations which flow on all matters from our shared family history, art and artists, poetry and prose, cinema and imagination, science and religion, just to mention a few of our favourite themes. And of course, my ongoing gratitude to my mother, Alice Halasz, whose unconditional support throughout our shared co-research into the lasting effects of Holocaust trauma is matched and balanced by her will to live life to the fullest as she surmounts life’s many, many obstacles, past and present, always with an inspirational smile, boundless energy and her formidable, focused mind. The times when I need to negotiate with her on subtle technical points in my writing has become known as my ‘Mum Test’. This article celebrates her 90th Birthday in 2017 and how we continue to sustain our research dreams in each other. Aron, L. & Starr, K. (2013). A Psychotherapy for the People: Toward a Progressive Psychoanalysis. London: Routledge. Davoine, F. & Gaudillière, J. M. (2004). History Beyond Trauma: Whereof One Cannot Speak, Thereof One Cannot Stay Silent. New York: Other Press. Halasz, G. (2012). Psychological witnessing of my mother’s Holocaust testimony. In: Goodman, N. R., Meyers, M. B., (Eds. ), The Power of Witnessing: Reflections, Reverberations, and Traces of the Holocaust. Trauma, Psychoanalysis, and the Living Mind (pp. 145–157). New York: Routledge. Halasz, G. (2017a) Introduction. Massive Trauma. Attachment Ruptured, Attachment Repaired. In: Salberg, J., Grand, S., (Eds. ), Wounds of History. Repair and Resilience in the Trans-Generational Transmission of Trauma . New York: Routledge. Halasz, G. (2017b). Editorial, Psychotherapy Update. Australasian Psychiatry. (in press). Halasz G. & Gordon V. (2015). Paradigm Changes from ‘Psychic’ to ‘Real’ Holocaust Trauma Transmission Between the Generations: Therapeutic Processes and Reparative Moments (2005-2015). Workshop, I.S.S.T.D. Sydney, Australia. Hopenwasser, K. (2008). Being in rhythm: dissociative attunement in therapeutic process. Journal of Trauma and Dissociation, 9, 349–367. Hopenwasser, K. (2017). The Rhythm of Resilience. A Deep Ecology of Entangled Relationality. In: Salberg, J., Grand, S., (Eds. ), Wounds of History. Repair and Resilience in the Trans-Generational Transmission of Trauma. New York: Routledge. Inside Out, (2015). Director, Pete Docter. Screenplay, Pete Docter, Meg LeFauvre, Josh Cooley. Kuriloff, E. (2010). The Holocaust and psychoanalytic theory and praxis. Contemporary Psychoanalysis, 46, 395–422. Main, T. (1957, ).The Ailment and other Psychoanalytic Essays, (Ed.) J. Johns, (The Ailment, p.12 – 35), Free Association: London, 1989. Prince, R. (2009). Psychoanalysis traumatized: the legacy of the Holocaust. American Journal of Psychoanalysis, 69, 179–194. Reubens P. (2007). Reflections on the Child Survivors of the Holocaust Roundtable. Psychoanalytic Perspectives, 5; 23-33. Video, Last Witnesses: Child Survivors of the Holocaust. Schore, A. N. (2012). The Science of the Art of Psychotherapy. New York: W.W.Norton. Salberg, J. (2017). The texture of traumatic attachment. Presence and ghostly absence in transgenerational transmission. In: Salberg, J., Grand, S., (Eds. ), Wounds of History. Repair and Resilience in the Trans-Generational Transmission of Trauma . New York: Routledge. Salberg, J. Grand, S. (2017). Editors’ Introduction. In: Salberg, J., Grand, S., (Eds. ), Wounds of History. Repair and Resilience in the Trans-Generational Transmission of Trauma . New York: Routledge. Son of Saul, (Hungarian Saul fia) (2015). Director, László Nemes. Co-writers, László Nemes, Clara Royer.